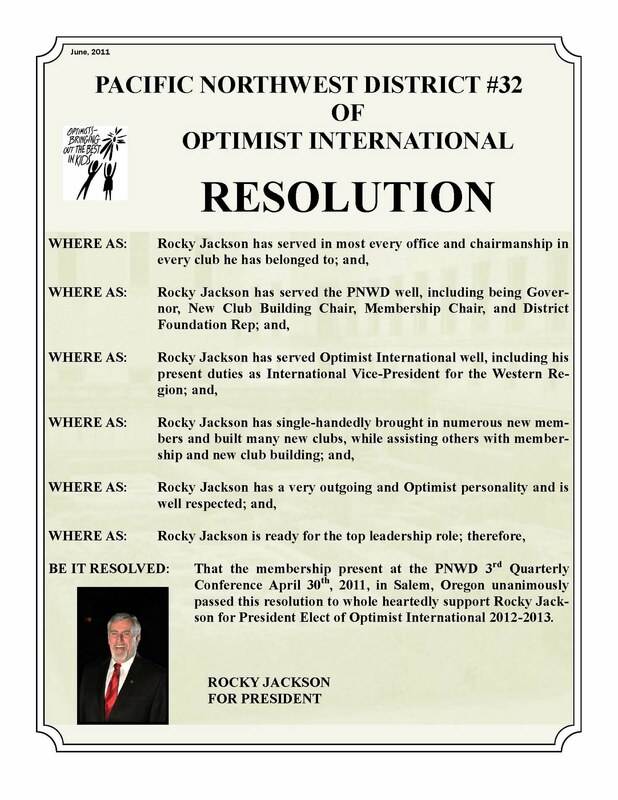 The Pacific Northwest District is proud to announce their support of Rocky Jackson for the position of President-elect of Optimist International. Rocky served as District Governor in 1992-1993 and since that time has supported the District in various roles including New Club Building Chair, District Foundation Representative, and leadership and membership development. He has worked tirelessly with many clubs from Idaho to British Columbia and beyond to help them with projects and to achieve their goals. He is especially active with clubs in Idaho and the Boise Valley in particular. In an unprecedented event, Rocky was elected from the floor at the 2009 Optimist International Convention in Florida to serve as Vice President of the West Region. Since October, he has spent nearly 100 days on the road visiting districts, zones and clubs throughout the West Coast. Rocky empowers others with his passion for Optimist Clubs and the mission of our organization. 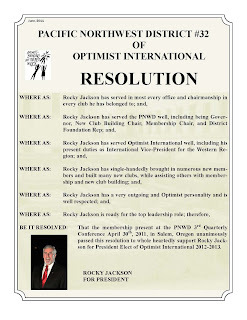 It is with that knowledge that the Optimist Clubs in the Pacific Northwest District hereby fully support Rocky Jackson for Optimist International President-elect. Please show your support by casting your vote for Rocky at the Optimist International Convention, July 3-5, 2011, Baltimore, MD.